This summer, we’re giving away some exclusive goodies for NATURE lovers of all ages! 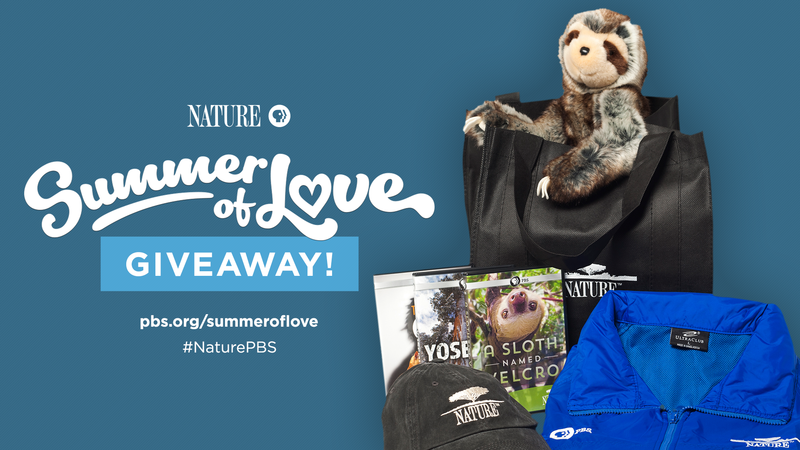 Each prize pack includes an official NATURE windbreaker, tote bag, baseball hat, DVDs of some of our favorite episodes, and an adorable sloth plush toy that’s just so easy to love! 2) Share NATURE with your friends by clicking the Forward to a Friend button at the bottom of the next newsletter. Between June and August, you can enter up to five times by forwarding to five different friends. Five winners will be chosen at random at the beginning of each month. NO PURCHASE NECESSARY TO ENTER OR WIN. INTERNET ACCESS IS REQUIRED EXCEPT AS OTHERWISE EXPLICITLY PROVIDED HEREIN. OPEN ONLY TO LEGAL RESIDENTS OF THE UNITED STATES WHO ARE 18 OR OLDER AS OF DATE OF ENTRY. EACH WINNER WILL BE REQUIRED TO RESPOND TO INITIAL PRIZE NOTIFICATION FROM SPONSOR WITHIN 24 HOURS AND MAY ALSO BE REQUIRED TO EXECUTE PRIZE ACCEPTANCE DOCUMENTS, AS MORE FULLY DETAILED BELOW. BY ENTERING, YOU AGREE TO THESE OFFICIAL RULES (THE “RULES”), WHICH ARE A CONTRACT. WITHOUT LIMITATION, THIS CONTRACT INCLUDES INDEMNITIES TO THE SPONSOR FROM YOU AND A LIMITATION OF YOUR RIGHTS AND REMEDIES. 1. Introduction: The “Summer of Love” Giveaway (the “Giveaway”) is sponsored by Interactive Engagement Group LLC, 825 Eighth Avenue, New York, NY 10019 (“Sponsor”). No purchase necessary. This Giveaway is governed exclusively by the laws of the United States. Internet access is required. 2. Start/End Dates: The Giveaway begins at 10:00am ET on Wednesday, June 20, 2018 and ends at 11:59pm ET on Friday, August 31, 2018 (the “Entry Period”). 3. How to Enter: During the Entry Period, an eligible entrant (“Entrant”) may enter the Giveaway by subscribing to our Nature newsletter during the Entry Period at the following URL: http://www.pbs.org/wnet/nature/newsletter. a. In addition to the foregoing method of entry, Entrants may earn up to five (5) additional entries, or chances to win, by referring friends to sign up for the Nature newsletter using the “Forward to a Friend” functionality at the bottom of the most recent newsletter. Limit one (1) additional entry per each friend referred. b. Each Entrant agrees to these Rules by subscribing to the Nature newsletter during the Entry Period as set forth above. Entrant must, as applicable, submit a valid email address in order to enter into the Giveaway. The person submitting email information as specified above will be deemed the Entrant. Limit one (1) entry per person, except as permitted in Section 3(a) above. All other duplicate entries will be disqualified. No automated entry devices and/or programs permitted. All entries must be submitted prior to the end of the Entry Period. Sponsor is not responsible for lost, late, illegible, stolen, incomplete, invalid, unintelligible, misdirected, technically corrupted or garbled entries, which will be disqualified, or for problems of any kind whether mechanical, human or electronic. An entry is deemed “received” when it is recorded by Sponsor’s servers. Proof of submission will not be deemed to be proof of receipt by Sponsor. Entries that are incomplete or do not comply with these Rules will be disqualified. Normal internet or mobile usage and access charges imposed by Entrant’s internet or mobile service provider may apply. Note: If you do not have internet access via a personal computer, you may be able to access the internet at your local library or internet café. 4. Eligibility: Entrant must be a legal resident of the United States who is 18 or older as of the date of entry and has a valid email address. Employees of Sponsor or its parent, subsidiaries, affiliates, advertising and promotion agencies, and any of their respective employees, shareholders, directors, officers, members, and agents and their respective immediate family and/or household members are not eligible to enter or win. Void outside the fifty (50) United States and the District of Columbia, and where prohibited, taxed, or restricted by law. All federal, state, and/or local laws, rules, and regulations apply. 5. Prizes: Five (5) winners will be selected monthly via a random drawing and each winner will receive the following items (each set a “Prize,” approximate retail value, or “ARV” indicated for each individual item in parentheses): Nature Plush ($29.00 ARV); Nature windbreaker ($30.00 ARV); Nature cap ($9.00 ARV); Nature bag ($2.90 ARV); and 3 DVDs ($27.00). The approximate retail value (“ARV”) of each Prize is Ninety-Seven Dollars and Ninety Cents ($97.90). Each Entrant selected as a potential winner must comply with all terms and conditions set forth in these Rules, and winning is contingent upon fulfilling all such requirements. 6. Random Drawing and Prize Awards: Fifteen (15) winners (5 per month for a total of 3 months) (each, a “Winner”) will be selected in a random drawing following the end of the Entry Period from all eligible entries received (or deemed received) during the Entry Period. Odds of winning depends on the number of eligible entries received as deemed by Sponsor. Winner will be notified on or around the first Monday of each month, by email to the email address used for entry. For the avoidance of doubt, such dates shall be on or around July 2, 2018; August 6, 2018; and September 3, 2018. The Prize will be shipped to each Winner (via ground shipping) on or about the fifteenth of each month (July, August, and September, 2018), subject to Sponsor’s timely receipt of address for shipment from the particular Winner. Sponsor makes no warranties with regard to any Prize, and each Entrant/Winner agrees that each Prize is provided as-is. If any Entrant selected as a potential Winner cannot be contacted within twenty-four (24) hours of first notification attempt, if Prize or Prize notification is returned as undeliverable, if a Winner rejects their Prize, or in the event of noncompliance with these Rules, such Prize will be forfeited and upon Sponsor’s sole discretion an alternate Winner may be selected via a random drawing from all remaining eligible entries. Upon Prize forfeiture, no compensation will be given. Limit one Prize per household. Prizes are not transferable. No Prize substitutions are allowed by Winner, but Sponsor reserves the right to substitute a prize of equal or greater value at its sole discretion. The Prize is not redeemable by Winner for cash value. Any taxes, fees and surcharges on the Prize are the sole responsibility of Winner. Sponsor reserves discretion with respect to all Prize and Prize delivery details not specifically set out in these Rules. Sponsor is not responsible for and will not replace any Prizes that are lost, mutilated, stolen, undeliverable, or do not reach any winner or are otherwise subject to circumstances outside Sponsor’s reasonable control. 7. Affidavit of Eligibility: Winner agrees to complete, sign, and have notarized an Affidavit of Eligibility, Liability Release, and Publicity Release (as required and/or permitted by applicable law) (collectively, “Prize Documents”) upon request from Sponsor, within the time frame and form specified by Sponsor, or prize may be forfeited. Any Prize Documents must be received by Sponsor within two (2) days of the date Sponsor sent them to Winner, email delivery to Sponsor-specified address to suffice. If any Prize Documents are incomplete, improperly completed, delivered late, returned as undeliverable, or otherwise faulty, a potential Winner may be disqualified and Sponsor may select an alternate Winner (time permitting and in Sponsor’s sole discretion). Sponsor reserves the right to modify all procedures in connection with selection and notification of any alternate Winner(s). Sponsor will have the right to photograph Winner. Entry constitutes permission to Winner’s name, picture, likeness, and city and state of residence for purposes of trade, publicity, or promotion for no additional compensation except where prohibited by law. 8. Release: By participating, each Entrant and/or Winner agrees to release and hold harmless Sponsor and its parents, subsidiaries, affiliates, advertising and promotions agencies, partners, representatives, agents, successors, assigns, employees, officers and directors (collectively, “Released Parties”), from any and all liability or cause of action, for loss, harm, damage, injury, cost or expense whatsoever including without limitation, property damage, personal injury and/or death which may occur in connection with, preparation for, travel to, or participation in the Giveaway or Event, or possession, acceptance and/or use or misuse of prize or participation in any Giveaway- or Event-related activity and for any claims based on publicity or other proprietary rights, defamation, invasion of privacy, or merchandise delivery. Sponsor is not responsible if the Giveaway cannot take place or if Prizes cannot be awarded due to travel cancellations, delays, or interruptions due to acts of God, acts of war, natural disasters, weather, or acts of terrorism. By participating in the Giveaway, Entrant agrees to be bound by these Rules and all decisions of Sponsor, in its sole discretion, which shall be final and binding in all matters relating to the Giveaway and any interpretation of these Rules. THE REMEDY FOR ANY CLAIM BROUGHT BY AN ENTRANT IN RELATION TO ANY ISSUES AND QUESTIONS CONCERNING THESE RULES, INCLUDING WITHOUT LIMITATION THE CONSTRUCTION, VALIDITY, AND ENFORCEABILITY HEREOF, AND ANY RIGHTS OR OBLIGATIONS OF ENTRANT OR SPONSOR IN CONNECTION WITH THE GIVEAWAY, WILL BE LIMITED TO ACTUAL OUT-OF-POCKET EXPENSES NOT TO EXCEED TEN DOLLARS ($10), AND IN NO EVENT WILL ANY ENTRANT BE ENTITLED TO RECOVER PUNITIVE, EXEMPLARY, CONSEQUENTIAL, OR INCIDENTAL DAMAGES, INCLUDING ATTORNEY’S FEES OR ANY OTHER COSTS RELATED TO SUCH CLAIM. Except where prohibited by law, any and all disputes, claims, and causes of action between Entrant and any Released Party arising out of these Rules or the Giveaway must be resolved individually, without resort to any form of class action or class-wide arbitration. 9. Miscellaneous: All entries become the sole property of Sponsor and none will be returned. In the event of a dispute, entries will be deemed made by the authorized account holder of the e-mail address or social media account submitted or used at the time of entry. The “authorized account holder” is deemed the natural person who is assigned to an e-mail address or social media account by an Internet access provider, service provider, or other online organization. A potential Winner may be requested to provide Sponsor with proof that the potential Winner is the authorized account holder of the e-mail address associated with the winning entry. If for any reason the Giveaway is not capable of running as planned, including due to infection by computer virus, bugs, tampering, unauthorized intervention, fraud, technical failure, human error or any other causes beyond the control of Sponsor that corrupt or affect the administration, security, fairness, integrity, or proper conduct of the Giveaway, Sponsor reserves the right in its sole discretion, to disqualify any individual who tampers with the entry process, and to cancel, terminate, modify or suspend the Giveaway. In addition, Sponsor reserves the right to award no Prize in the event that insufficient eligible entries are received. Sponsor assumes no responsibility for any error, omission, interruption, deletion, defect, delay in operation or transmission, communications line failure, theft or destruction or unauthorized access to, or alteration of, entries. Sponsor is not responsible for any problems or technical malfunction of any telephone network or lines, computer online systems, servers, or providers, computer equipment, software, failure of any e-mail or entry to be received by Sponsor on account of technical problems or traffic congestion on the Internet or at any web site, any combination thereof, or otherwise, including any injury or damage to entrant’s or any other person’s computer related to or resulting from participation or downloading any materials in the Giveaway. Sponsor may prohibit an Entrant from participating in the Giveaway or winning a prize if, in its sole discretion, it determines that said Entrant is attempting to undermine the legitimate operation of the Giveaway by cheating, hacking, deception, or other unfair playing practices (including the use of automated quick entry programs) or intending to annoy, abuse, threaten, or harass any other Entrants or Sponsor representatives. CAUTION: ANY ATTEMPT BY AN ENTRANT TO DELIBERATELY DAMAGE ANY WEB SITE OR UNDERMINE THE LEGITIMATE OPERATION OF THE GIVEAWAY MAY BE A VIOLATION OF CRIMINAL AND CIVIL LAWS AND SHOULD SUCH AN ATTEMPT BE MADE, SPONSOR RESERVES THE RIGHT TO SEEK DAMAGES FROM ANY SUCH PERSON TO THE FULLEST EXTENT PERMITTED BY LAW. If any provision herein is determined invalid or unenforceable, these Rules will otherwise remain in effect and will continue unimpaired with full effect. Sponsor’s failure to enforce any provision herein will not constitute waiver of that provision. 11. List of Winners: To obtain a list of winners, contact TonerH@wnet.org.